EDMONTON, Alta. – Alberta Motor Transport Association (AMTA) president Chris Nash believes companies that do not embrace diversity and inclusiveness will soon struggle to find talent. Nash was part of a four-person panel that tackled the question several company executives may ask themselves of late: why does being a divers and inclusive workplace matter? Nash said during his more than 30 years of experience in the industry before coming to his current role with the AMTA, he saw firsthand the challenges of inclusivity in trucking, particularly when it comes to women. Nash said the AMTA works to promote these ideas to the industry and its members, making it more accessible to more people who can bring these ideas to the industry. 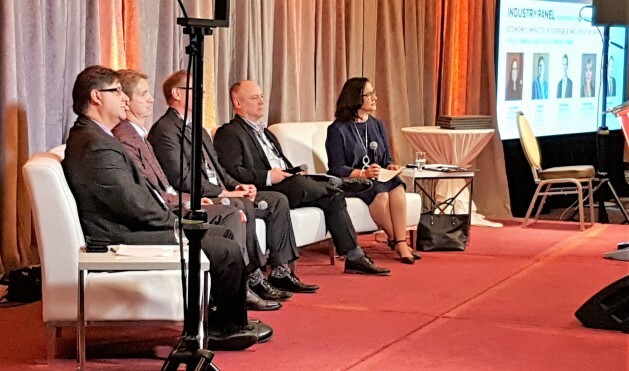 An industry panel that included AMTA president Chris Nash discussed the importance of diversity and inclusion during the WBF Work Proud Summit in Edmonton Oct. 3. Paul Verhesen, CEO of Clark Builders Group of Companies, said with each generation, the biases we see toward women in traditional male roles starts to diminish. Nash said companies need to examine the reasons a person would decide to leave a position, and then compare that to the list of reasons someone working in an industry where they are typically not the type of person to fill such a role would have. Dean Wilcox, vice-president of the Edmonton refinery for Suncor Energy, said his company is short-staffed, and ignoring the female talent pool would be a mistake. Verhesen said businesses that reject the idea of diversity and inclusiveness will miss something. “When you put a different group of individuals who have had different experiences, different life lessons, the thinking and the outcome of thought benefits the business far greater than if you put a bunch of similar folks together in a room,” he said. In addition to diversity as it pertains to women, Wilcox underscored the importance of other under-represented groups as well, like Aboriginals. He said top companies are tapping into Indigenous groups to bring the best pool of candidates through their doors. Millennials were another group addressed during the panel discussion. Nash said it can be a challenge for his generation to wrap their minds around the millennial worker and the different attitude they bring to the table compared to generations before. Companies looking to bring more diversity and inclusivity to their workplaces must do so in a well-thought out manner, and avoid going at it half-assed. Brent Davis, vice-president of mining solutions for Finning Canada, said he has been part of efforts that seemed like good ideas at the time, but backfired. Davis said the “good idea” was implemented without proper planning and education, and it ended up creating an unintended negative impact that slowed down the entire process of diversification and inclusiveness. Now, the company educates its employees why diversity and inclusion is important, something Davis said most people understand. Nash said the AMTA establishes benchmarks and measurements of what an employee should be, regardless of gender or identity. Verhesen believes conversations about inclusivity need to happen earlier rather than later, and one of his biggest regrets is that his company was not forward-thinking when it needed to be. Verhesen added that one of the industry’s biggest challenges is its past success. Nash said the trucking industry also waited too long to move toward diversity and inclusiveness. With the average age of a truck driver now 47-year-old, and expected to be 49 by 2024, there is a need for fresh blood. One area Nash pointed to that needs improvement is rest stops, which are lacking in Alberta and nationwide. “When your option to pull over is a wide spot and there are no facilities, it’s not really a thrilling adventure,” he said. “It would be like walking out your door where you work and having to go to the washroom outside.
. More is needed in the line of classification as a driver being a trade or skilled labor for us to all survive and get better pay structure in Canada. Much is needed in the line of parking rest areas and washrooms. Women don’t enjoy peeing in a ditch it is a lot harder for us than it is for a man. We need bigger truck stops where there are reserved spots for solo female drivers. Safe places where women can park that do not put us in danger of harm. Many small communities do not have Safe parking or parking at all. It is hard to get a good night’s rest when every noise outside the truck has you on highest alert for theft of cargo or personal safety. Just to name a few things off the top of my head. I am a long haul trucker of 1.5 yrs and these are only the tip of my concerns as a solo female driver. Many customers do not provide bathrooms for women truck drivers.Why drive truck when can make the same money per hour as a personal support worker or waitress in bar in Canada. My niece works for Costco and make $ 29.00 CD per hour . Different conference, same talk, essentially. Changing the inside of the industry is fine, but if you don’t fix the outside…little will change. You can renovate and modernize the inside of your house, but if the outside is unpainted, and the yard is covered in weeds and garbage, no one will come knocking at your door.